Why Robin De Ruiter boycotted the books? Robin de Ruiter had first published the book about the attacks on September 11 in Germany. Issues such as the secret CIA flights had already been mentioned in the book. In the Netherlands the book ignored by the press and many bookshops refuse to sell it. His new book THE 13 satanic bloodlines boycotted. This book, translated and published in more than forty countries, leads us along a hidden deep trace in the actual history of the world. This book includes several sensational publications about the planned New World Order. She first appeared in book form in 1989 by his publisher in Mexico. But in the Netherlands, it proved impossible to publish this book. Without exception gave reputable publishers know that the Netherlands was not ready for this book. " The same happened to him with the publication of his book, George W. Bush and the myth of al Qaeda - the hidden power behind the terrorist attacks of September 11, 2001. This book has garnered many international book fairs and among audiences worldwide success. Despite the worldwide success of this book, he received comments from Dutch publishers as "too explosive" and "dangerous." And that precisely in a country like the Netherlands! First of all, who is Robin de Ruiter? Robin de Ruiter (1951 Enschede in the Netherlands born writer. However, Rider is largely grown in Spain). In Spain, he studied theology, history and Spanish, and in 1974 obtained his title. As a writer, he began his career as a freelance writer for a variety of Spanish-language magazines. His writing / work area was that of politics and religion. Later it would focus more on the author of books, for that he always does a lot of research, especially in Latin America, he is known to be defined by their extraordinary research capabilities. He became really famous through the book, the hidden power behind the Jehovah's Witnesses, as well as insight into the world of Jehovah's Witnesses. Most of the Rider's books were sold well and bestsellers. Several books also appeared in more than 40 countries. One of the best sellers of his was the book, George W. Bush and the myth of al Qaeda - the hidden power behind the terrorist attacks of September 11, 2001, for which he also received in 2005 the Frontier Award. In the book appeared in the Netherlands by a publishing house which he had established himself after he could not find a publisher wanted to publish the book. The boycotts follow each other! But resistance creates strength and in February 2005 he decided to spend in the Netherlands the book itself. In November, George W. Bush and the myth of al Qaeda was awarded the annual "Frontier Award 2005" for the most controversial issue and the in-depth investigation that preceded it. The award was in front of the entire media issued in Amsterdam. Unlike in other countries, the book was however ignored by the same corporate media ... What's going on here? 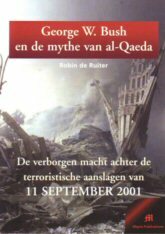 Due to the success we decided to publish the "precursor" of the book George W. Bush and the myth of al Qaeda in its own management in Dutch. The Dutch translation of the 13 Satanic Bloodlines is a new updated edition of the original book. The new edition has been compiled with the utmost care. Robin de Ruiter has book published. George W. Bush and the myth of al Qaeda - the hidden power behind the terrorist attacks of September 11, 2001. The writer is the international 'award winning' book with many startling facts, creating an image of the evil attacks of September 11 2001, which is significantly different from the official version. Where others merely asked questions and doubts, the author develops the first time a completely different version of events. With high insider information and never before published sources is demonstrated that the United States was involved in the events of September 11. The so-called terrorists were suspected double agents. They only served to camouflage the real culprits and their mission was to lay the railway in the direction of Islam. Who does not know how Washington world was ripe for the war against terrorism can not ignore this book. This book is intended to help ensure that as many people will come to realize what hangs over their heads in the coming years and why. The author in this book nothing or no one untouched and shows - on the basis of numerous facts - the shocking state of affairs behind the scenes of world politics. Also available in German, Italian, Portuguese, Spanish and French. This book is dangerous for several reasons. Unlike popular New Age thrillers and novels carries Robin Rider us along a hidden deep trace in the actual history of the world. Few historians are aware of this. Thus the author rewrite our world's history from early Christianity to the present day. It's not so good with this earth. It is also not so good with the global relations between many countries. But what is the real reason? Bestsellers conquer the world and led us astray into a blood line that takes us straight to the Antichrist. Robin de Ruiter exposes precisely this occult blood line that goes back to the Merovingian times, the Sicambriërs, the Roman Empire, the Greeks and the tribe of Dan. From the ancestor of the tribe of "Dan" from the Old Testament to the current political world leaders, Robin Rider reveals the pervasive power of a small elite: the Illuminati. This book - published in more than 40 countries - is one of the most acclaimed publications on the Antichrist and his evil organization, its goals, its methods and its origin. Also available in German, Turkish, Portuguese, Spanish and French. 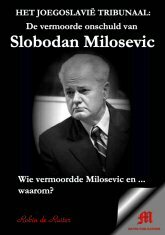 All media sketches around the world Slobodan Milosevic as "The Butcher of the Balkans". If you have this opinion about the former president of Yugoslavia believe, then you need this book, so do not read. The evidence of the International Court in The Hague was very bad. It gradually became increasingly clear that the accusation was not even worth the paper it was written. And Milosevic was about to call important witnesses who could make the prosecutor sometimes difficult, especially considering the fact that its main witnesses have made false statements. With fear and trembling, the 'tribunal' this time closer. The Russian General Leonid Iwaschov said: "Slobodan Milošević was the only man who could testify clear the role of the United States during the bloody disintegration of Yugoslavia in the nineties - fully and in detail. And that's exactly where he fought during his trial for war crimes and genocide. " Milošević was perhaps silenced before he painfully expose the crimes of our rulers? The death of Milosevic mean that those who bombed Yugoslavia, the actual perpetrators, once and forever go unpunished. They can never be prosecuted. " Who killed MILOSEVIC AND ... WHY? How can you buy this book? These international bestsellers are available through bookstores or by prepayment by Mayra Publications. Transfer the total amount of your order, stating the ISBN numbers of the books you want, your name and address, account number 44.84.56.729 in the name of Mayra Publications Enschede. You will receive your order within three days at home without shipping. Publication Ban demanded to Ban Landmines Book. Access to water no fundamental right.